Bar-S Services of Cheyenne, Wyo., lifts a 65,000 lb. (29,483 kg) “sub” on a box-on-box triple drill rig with its Link-Belt ATC-3275 all-terrain crane near Ault, Colo.
Cheyenne, Wyo.-based BAR-S Services (BAR-S) took ownership of a new 275-ton (250-t) ATC-3275 all-terrain crane from Link-Belt distributor Strong's Crane Service. In its nearly third decade of operation (founded in 1990), BAR-S specializes in erecting and dismantling oil rigs, supporting the oil and gas industry in northeastern Colorado and Wyoming. When not supporting the oil and gas industry, the company operates its new ATC-3275 as a taxi crane covering a 300 mile working radius. “Our primary work is moving drilling rigs, but we also work with other transportation and production facilities moving large equipment,” said Patty Smith, co-founder of BAR-S Services Patty Smith. Bar-S uses the Link-Belt all-terrain crane to perform tandem lifts up to 240,000 lbs. (108,862 kg) and solo lifts up to 100,000 lbs. (45,359 kg) on rig moves. 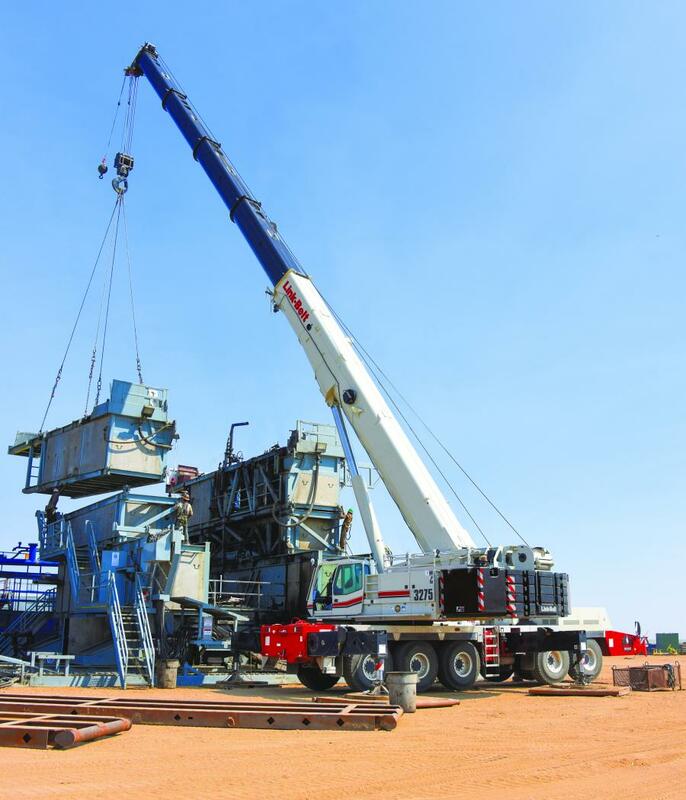 A drilling rig can have up to 50 lifts to disassemble and once Bar-S has the rig loaded on semi-trailer and moved, the process is reversed for assembly at a new location. In late 2017, Bar-S used its ATC-3275 to complete a rig move in Greeley, Colo. The following day the ATC-3275 travels 175 miles to Casper, Wyo., to lift a 145,000 lb. (65,770 kg) transformer. The ATC-3275 lifts and places the transformer on a long-haul truck using 8-part line while keeping the load inside a 25 ft. (7.62 m) radius. 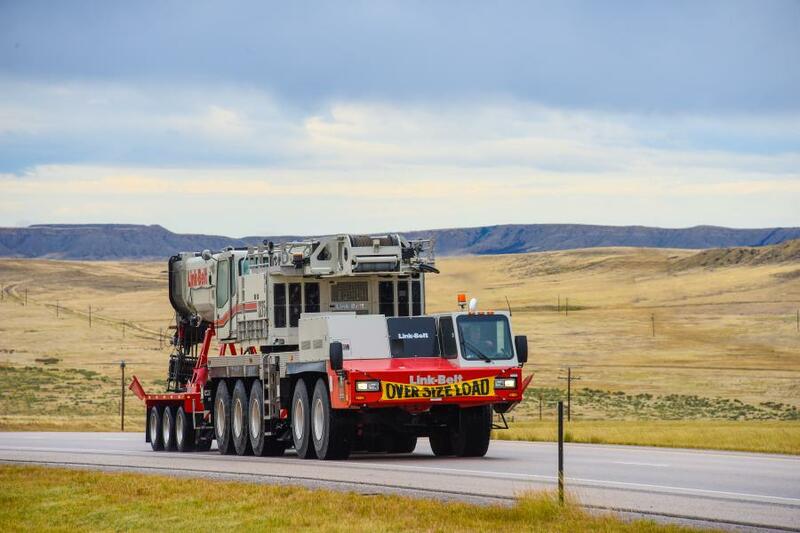 On day three, the ATC-3275 is dispatched with minimal counterweight to Laramie, Wyo., to lift multiple 20,000 to 30,000-gallon (75,700 to 113,562 liters) fuel tanks for a new Love's Travel Center. Remote controlled directional boom floodlights on the crane ease the process of attaching rigging in the dark, as well as for placing the large 37 to 57 ft. (12.3 to 19 m) long cylindrical tanks. Over the course of 96 hours the ATC-3275 has made more than 50 lifts, in three towns, travelling more than 1,000 miles to handle the taxi work required of northeastern Colorado and Wyoming.